Your first upgrade in search of more speed should be wheels. Why? It’s down to physics and the fact rolling weight has a significantly greater impact on cycling performance than static weight (the frame). It means cutting just a few hundred grams can result in a dramatic upshift in speed. Take Vision’s Metron 40 SL tubulars, which hit the scales at a lightweight 1,330g. You’ll notice that reduction in excess not only during accelerations, like pulling away from your clubmates, but also during climbs where every ounce counts in the fight against gravity. You can also save time and increase speed with a set of aerodynamic wheels. A number of wind-tunnels around the world have shown savings of 1-2% over 40km when rolling along on these stealth hoops, and the principle is relatively simply: the deeper rim of aero wheels smooths out airflow, creating less drag than a shallow-rim wheel. In turn, you carve through the air with less resistance. 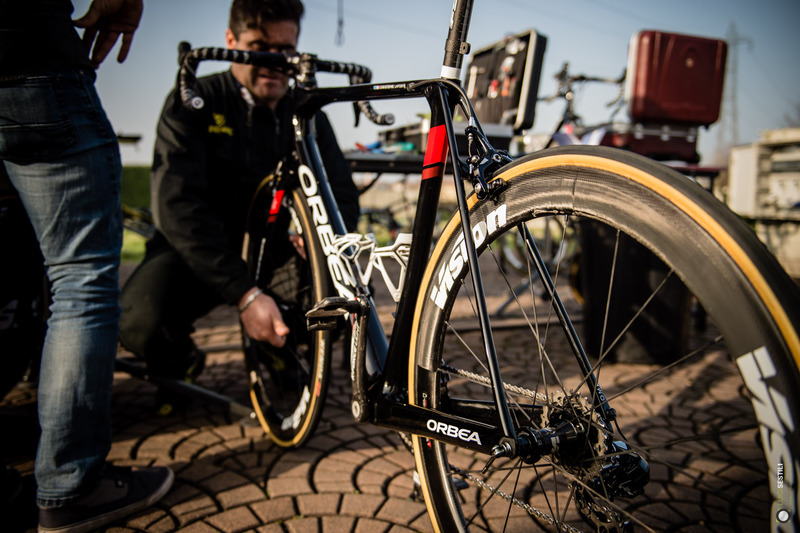 You can’t get much more aerodynamic than Vision’s Metron 81 SL that, as the name suggests, come with an 81mm-deep rim. It’s one fast wheel, though can be tougher to handle than shallower rims so is preferably used in time-trials. Instead, the Metron 55 SL is the roadie’s aero wheel of choice, albeit its low 1,430g weight means it’s adept at climbing, too. It stands to reason that the only part of your bike that comes into contact with terra firma has a huge impact on rolling speed and comfort, but too many of us stick with the set that came with our bikes. That’s a mistake. Instead, look for a summer tire that has a high TPI (threads per inch) count. A high number refers to the fine nylon threads used in the casing, which results in less rolling resistance and more speed. The downside is their puncture-resistance isn’t immense; instead, when winter draws in, go for a set that utilises extra thick rubber or applies layers of advanced material technology to keep out off-season hedge cuttings and detritus. A pair of 25mm-wide tires is also a wise choice as science – and use by most professional racers – demonstrates that they’re comfortable and fast. Electronic groupsets are arguably the most impressive cycling evolution in recent years. While traditional groupsets employ cables and a rather parochial shift between gears, electronic sends a current down a wired cable to move the derailleurs or, in the case of FSA’s new K-Force WE groupset, shift the derailleur wirelessly. Among a wealth of benefits, this results in more precise and swifter shifting. ‘Out of sight, out of mind’ is a proverb that could have been invented for the humble bottom bracket. But fit a poor-quality one and your crankset will rotate inefficiently and you’ll leach energy with every pedal stroke. Peak performers should seek out those with ceramic bearings, like FSA’s MegaEvo Ceramic. Why is down to two key reasons. The first is that they reduce drag. The second is that they can last 10 times longer than steel bearings. They’re not the cheapest component around but you know that they’ll last. Your bike computer performs its job with diligence and reliability but if you’re serious about improving your cycling performance, a power meter’s a must. As the name suggests, power meters measure the amount of wattage you generate on a bike and relay this information to your handlebar head unit. One example is FSA’s PowerBox carbon crankset, which employs a P2M convertible spider design for multiple chainring options. Why is all this power data useful? Because once you’ve obtained your functional threshold power (FTP) – the maximum power you can sustain for an hour – you can set zones to ride at based on the physiological adaptation you’re seeking. This could be improving technique in zone one (around 55% of FTP) to short, intense sessions in zone six (121-150% FTP) to build speed.